Kalikot, Mugu, Jumla, Bajura and Bahjang are some of the poorest districts of Nepal. Smallholder farmers here struggle to produce enough food to feed their families. Isolation, poor infrastructure and erratic rainfall make the situation worse. Many men migrate to India for work, leaving women to manage families and farms on their own. Nearly half the population in these districts live below the poverty line and many are also from the most marginalised ethnic groups, including the Dalits and Janjatis. These are often left out at the periphery of decision-making and local development. Most people in this region, where less than 2% of land is arable, are dependent on agriculture, collection of non-timber forest products, wage labour and remittances for their livelihoods. 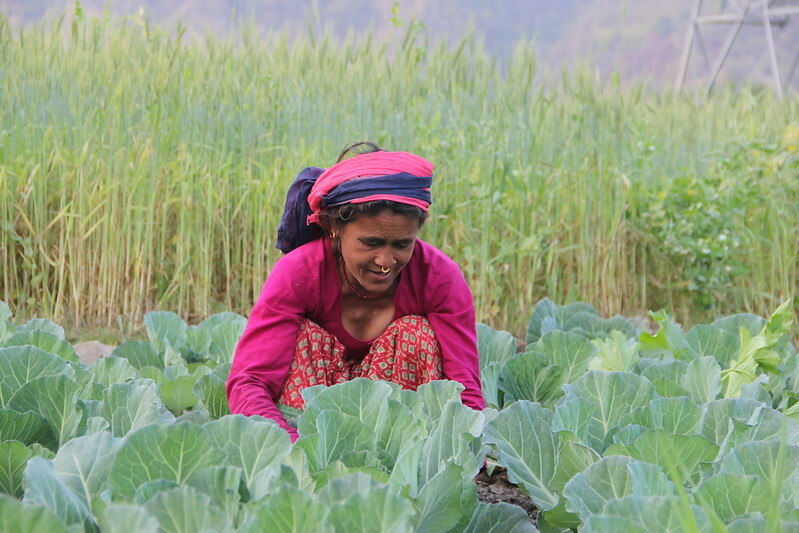 Instagram legends and award-winning podcasters The Scummy Mummies went to the far west of Nepal to find out more about how our work is helping women farmers get their produce to market. Through small infrastructure development, promotion of new agricultural technologies and market linkages the project is helping help 7,000 smallholder farmers increase their incomes. 70 village animal health workers to serve 7,000 farmers and their 45 cooperatives with services, products and advisory support. This network will deliver over 300 demonstration sessions on micro-irrigation technologies such as drip irrigation, improved harvesting methods and climate-resilient crop selection; they will act as a ‘frontline’ helpdesk to answer farmers’ queries and preoccupations. Farming productivity will also be enhanced through improved crop storage, facilitation of access to market hubs through 5 new gravity ropeways and continuous capacity building through the ‘Farmers Business School’ and local resource centres. New gravity goods ropeways are helping to deliver link up the markets for agricultural products. Training for local cooperatives has developed the knowledge to map market opportunities, form agro-processing enterprises and develop entrepreneurship skills. Cooperatives are making links with financial institutions (banks, micro-finance organisations) to lobby for reasonably priced services and products for rural farmers, using their past experience such as self-run goat insurance schemes. Prem Saud from, Bajura is the proud operator of gravity goods ropeway. Before this project, the produce of Bajura district often used to go waste. Lack of transportation meant that very little produce used to reach the market. Now following the installation of a gravity goods ropeway the community is reaping the benefits. Not only does agricultural produce reach the market fresh, but other goods can be easily transported back to the communities. Saud collects NRs 20 (15 pence) for every 10 kilograms of goods transported, this is used for the maintenance of the ropeway. The critical role of Technology Justice in effective adaptation. Agricultural adaptation to climate change is critical for food security and economic development; if it is to be truly ‘climate-smart’ for smallholder farmers, it must be inclusive and protect the natural resource base upon which agricultural livelihoods depend. This paper uses Technology Justice as a lens to discuss the climate resilience of smallholder agriculture systems. It argues for user-centred technological innovation and supports agroecological approaches as a powerful way to promote the inclusion of marginalized farmer groups, increase adaptive capacity, and realize food security and economic development in the context of climate change. Using Technology Justice in agriculture to leave no one behind. This is the third paper in the Technology Justice Briefing Series., To eradicate extreme poverty means focusing on the 500 million smallholders so they can reliably generate more food and income from their agricultural activities. This paper uses the three pillars of Technology Justice (access, local innovation, and sustainable use of technologies) to assess the range of agricultural development pathways available. Agroecology emerges as the strongest pathway for leaving no one behind and meeting the triple challenge of productivity, sustainability and poverty eradication, as outlined in the Sustainable Development Goals. This policy briefing presents existing evidence and research in agroecology alongside case studies of successful initiatives with scalable potential, particularly where market systems are at the core of development practices. Considering the barriers to scaling up agroecology, the paper recommends that development actors work together to identify incentives to enable systemic change, through facilitating market systems and private-sector engagement in agroecological production and value chains.